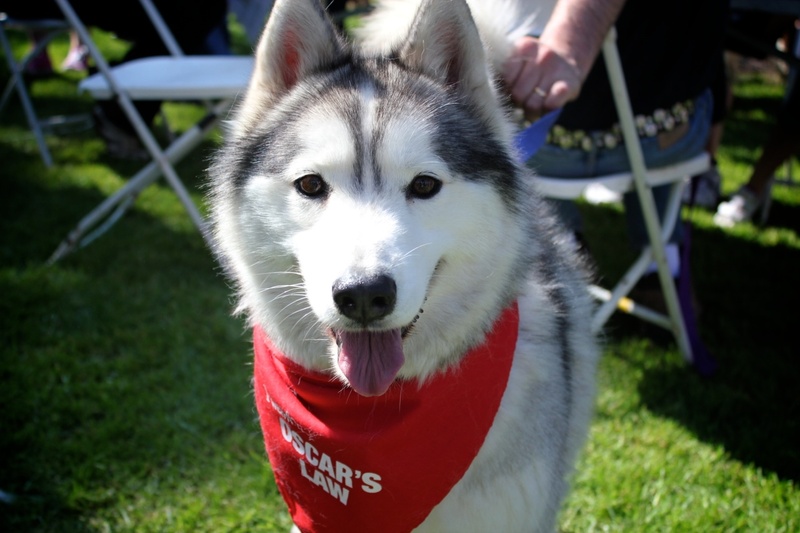 The Lost Dogs’ Home team was proud to be a part of the very successful Oscar’s Law Puppy Factory Awareness Day on Sunday 18 September. Perfect weather conditions welcomed thousands of animal lovers to rally and be a voice for the dogs and puppies imprisoned in puppy factories. It was truly inspiring to look upon a sea of people spilling out from the steps of parliament onto Spring Street. The Oscar’s Law logo was everywhere: from t-shirts, to giant banners, to waving cardboard hands on sticks. People brought their children and their pets to stand up and say no to puppy farming. After listening to a number of speakers including Tracey Bartram, Shelter Manager for RSPCA Allie Jalbert, Shantha Hamade from the Barristers Animal Welfare Panel and Meg Ryan from Victorian Animal Aid Trust, the crowd were addressed by Oscar’s Law founder and passionate campaigner Debra Tranter who had with her Oscar himself, rescued only weeks ago from a puppy farm. As expected, she received an amazing reception. The thousands of protesters then made their way back to the Treasury Gardens to visit a variety of marquees set up by animal welfare organisations and rescue groups. The Lost Dogs’ Home marquee was very busy, giving away show bags for a gold coin donation to raise money for Oscar’s Law. We also sold merchandise and accepted many generous donations. The team were so pleased to see people taking information away about the Home’s Foster Care Program, Volunteer Program, Online Pet Licence initiative and the National Pet Register free ID tags. In total, The Lost Dogs’ Home raised $1,593.05 which will be donated to Oscar’s Law’s and support Debra Tranter in her important campaign to ban the factory farming of our companion animals. It gives all of us at the Home great pleasure to make this donation. A big thank you must go to the Home’s wonderful volunteers and staff who helped out on Sunday. They did a fantastic job and enjoyed the opportunity to meet and chat to so many likeminded, passionate animal lovers.